Visible light is a form of electromagnetic radiation. Other forms of electromagnetic radiation are like light in many ways; they are just at different wavelengths that the human eye cannot see. Since wavelength is what makes the difference between colors in visible light, you might say other wavelengths of electromagnetic radiations are “invisible colors of light”. Radio, infrared, visible light, ultraviolet, X-rays, and gamma rays are all forms of electromagnetic radiation. Animation displays in order by Longwave, Midwave, Shortwave, Natural Light. Fluorescence is luminescence caused by electromagnetic radiation. Visible light can cause luminescence; shine a pure violet light at a ruby, and it will glow red, as it has absorbed the violet light energy and used it to create red light. But light-induced luminescence is uncommon and hard to see. Radio and infrared supply too little energy concentration to cause visible luminescence. X-rays cause many dramatic luminescences, but X-ray sources are too expensive, not portable enough, and require too much shielding and attention to safety for ordinary use. The form of electromagnetic radiation that is most easily used to observe fluorescence is ultraviolet radiation, as generated by a “black light” or UV lights. Ultraviolet is shorter than visible light in wavelength. The name came after the 1801 discovery that sunlight sent through a prism has an invisible component beyond the violet end of the spectrum, causing a reaction in silver chloride solution that darkened it even more than visible light. The notations LW, MW, and SW are most often used by minerologists, with the bands generlly centered around the mercury gas emission lines of 365nm, 311nm, and 254nm. The UVA, UVB and UVC notations are very similar, though UVB is generally centered around the 300nm peak of the biomedical action response curve. It is common for diagrams to show longer wavelengths on the left, because shorter wavelength light has higher energy photons. Longwave ultraviolet is part of sunlight. It is the lowest-frequency ultraviolet, and thus the nearest to visible light. Longwave ultraviolet passes easily through most transparent types of glass and plastic, and longwave ultraviolet lights are the most durable and readily available. In the medical realm, longwave UV is tradititionally filtered through Woods glass in a Woods lamp named after its inventor, but now using the same technology as high quality longwave mineral lamps. Longwave LED lights are becoming more popular as they increase in power and improve the focus of the UV light into a beam. 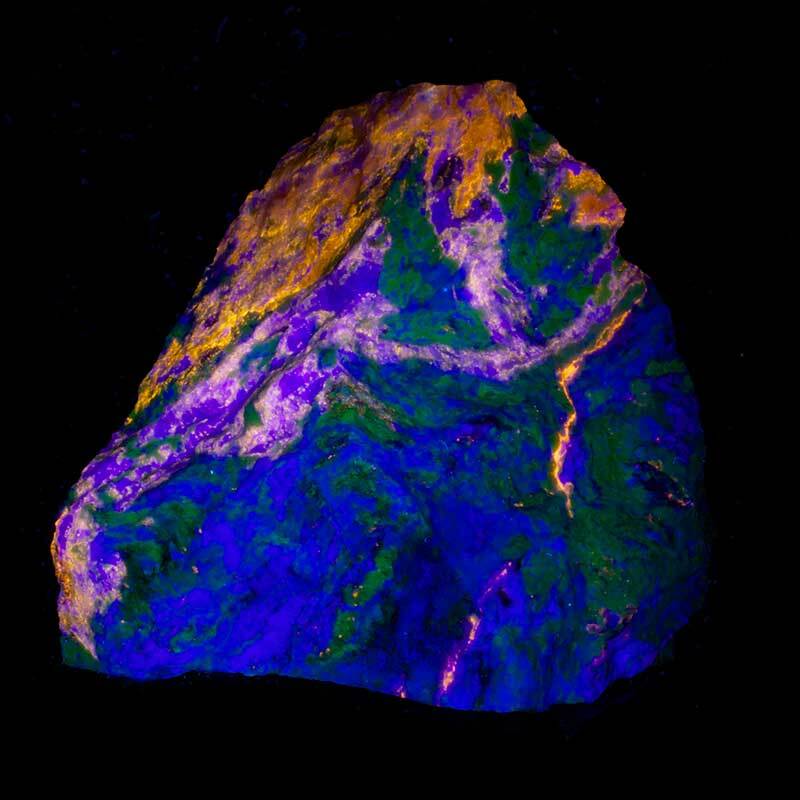 Approximately 15% of fluorescent minerals respond well to longwave UV excitation. Midwave ultraviolet is also part of sunlight. The body produces vitamin D using midwave UVB. UVB is notorious for causing sunburns, but also activates (melanocyte) skin cells that use longwave light to make melanin, which tans the skin and helps to protect against sunburn. Midwave, especially shorter wavelengths, is almost completely blocked by common glass. Since midwave ultraviolet is passed by shortwave ultraviolet filters, and UVB tubes have recently become more available, many collectors are using midwave to study mineral fluorescence. Shortwave ultraviolet is emitted by the sun, but it is stopped in the upper atmosphere of the earth by the ozone layer. Shortwave ultraviolet readily causes delayed skin and eye burns, so even indirect exposure should be minimized, especially to high power SW UV lights. Shortwave ultraviolet is blocked by most forms of glass or plastic. Quartz or special glasses must be used in shortwave tubes to let the shortwave UV escape the tube. Shortwave ultraviolet causes slow failure of the filters currently used in shortwave ultraviolet lights through a process is called solarization. Shortwave ultraviolet is the most popular for seeing mineral fluorescence, and the higher photon energy causes fluorescence in perhaps 90% of fluorescent minerals. Extreme ultraviolet is also emitted by the sun, but is also stopped by ozone in the upper atmosphere. That ozone (O3) is formed from atmospheric oxygen (O2) molecules split by the higher energy UV in sunlight, which accounts for the ozone holes forming during the dark polar winter. It is this high ozone layer that stops part of the sun’s middlewave ultraviolet rays and all of its shortwave ultraviolet rays, and which may be in danger from some commercial chemicals. Also called Vacuum UV because it forms ozone at wavelengths below about 200nm which blocks it own transmission through air, extreme ultraviolet extends to soft X-rays in frequency, and the equipment is typically found only in laboratories. Few substances are transparent to extreme ultraviolet, and even air stops it within a fairly short distance. UV light emitting diodes are becoming common in LED flashlights, though true UV emitters are still relatively expensive. Blue and almost-UV LEDs often emit over a broad range tapering off into the visible, but narrow wavelength 405nm deep blue laser diodes are now in consumer electronics. Yellow glasses will improve the viewing contrast, and these solid-state sources can reveal unique fluorescence responses in the visible range.